Cole's Perfect Puppy is a Christian novel intended for young readers who love animals, especially dogs. 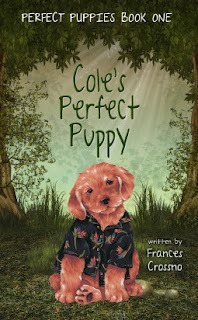 The story revolves around Cole, his younger brother Caleb, and their new-found friend Rachel who teaches the brothers about friendship, sacrifice, and God’s perfect love. I absolutely loved this book. I sat and read it in less than thirty minutes. I liked how the author showed the older brother taking responsibility for his younger brother. She also showed that the older brother could be a little irresponsible when distracted. All of the characters were believable. The situations such as bullying, standing up for others. Giving to others by making a personal sacrifice are lessons I want my students to learn. Both Rachel and Cole and his brother Caleb had hardships when it came to their parents. I won't tell what it is because I don't want to spoil it. I read a review that said this book would be great for a Christian school or library. I find it perfect for a public school because students will be able to relate to the message. I also love that my Christian students will be able to find books their parents will approve of them reading. I loved the Christian message presented, yet not crammed down the reader's throat. I finished the book and took it in to my mother and told her she had to read the book. I gave her just enough info she started thinking about who we knew that would love a copy of this book. I will enjoy putting this on my school shelves and recommending it to all of my students.